It was an exciting 10 days! 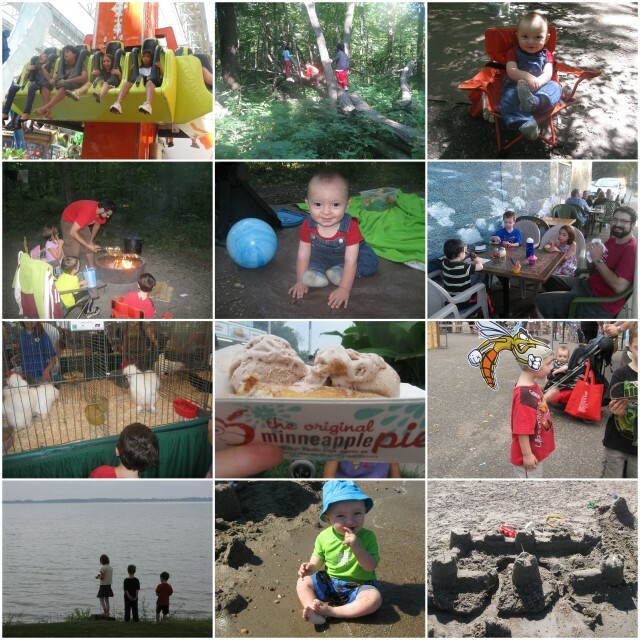 Highlights included: rides at the mall, camping at Mystery Cave/Forsestville state park, a tour of the Mystery Cave (which I neglected to take any pictures of! ), going out for Gelato, a trip to the Minnesota State Fair (largest fair in the country by average daily attendance! ), a trip to the extended-family lake cabin and nearby beach. Temperatures have finally moderated and it’s getting cooler at night. We didn’t go to the pool at all this week. The boys pulled out pants and long sleeve shirts (I guess 55 or 60 feels cold after weeks of lows in the 80s!). 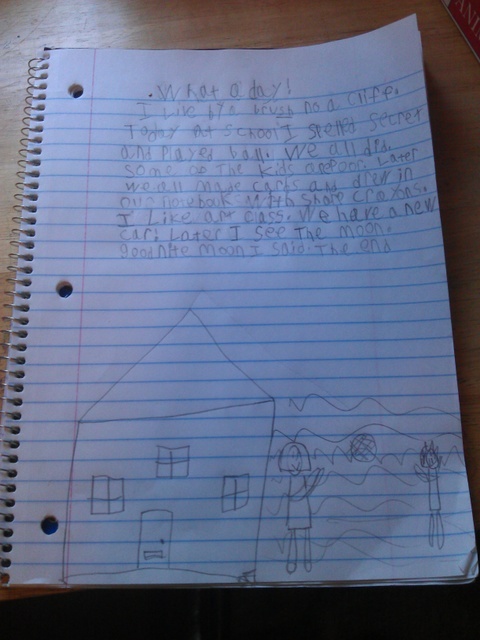 We added back in another school subject for Miss M. Slowly, it’s starting to feel a bit more like fall around here. We even found a few leaves prematurely changing color! We still have a few last hurrahs of summer left on our calendar though before we really dig in to our full “school year schedule.” Next week we have Vacation Bible Camp at church. I’m directing our VBC for the third year in a row. I have to admit I have been kind of “phoning it in” in terms of my organizational duties based on work done in previous years — but that kind of caught up to me this week and I spent a lot of time answering emails (hence the lack of blog posts…too much computer time eaten up by that effort!). 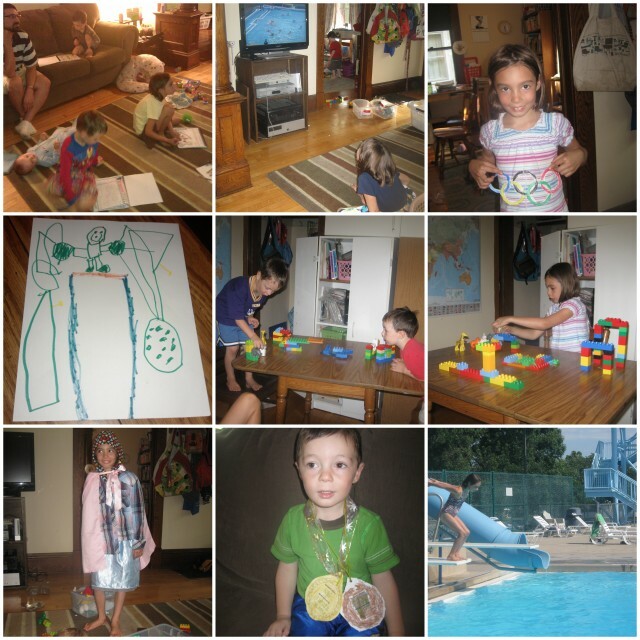 Following our week of VBC, we have our vacation/staycation week 11 days. We’ll be taking a couple of short trips out of town, plus doing a few more summer bucket list items here in the metro during this time Tony has off from work. 1-2: I love our annual block party for National Night Out. NNO is very popular here — the city of Minneapolis makes it really easy for individual blocks to block off the street and have a party for a couple hours on the 1st Tuesday of every August. Many, many blocks in our neighborhood participate! This year we were treated to a visit from the mounted police officers! Doesn’t baby J look relaxed? All the kids have a great time playing with other kids on the block, on the one night of the year that it’s okay to ride your bike in the street! 3: This week’s “most creative” awards go to Mr. E for his collage of a “candy robot” and a collaborative effort from all the kids on this airplane. 4-6: Cooler temps meant more time outside doing things other than swimming. We took the books and blanket outside for some school time (which never happened outside…too many distractions). Miss M tried rollerblading for the first time! 7. A sudden rainstorm led me to declare a spontaneous indoor picnic yesterday with cocoa, popcorn and finger foods for lunch. I read three and a half chapters of our current history read aloud (Om-Kas-Toe: Blackfeet Twin Captures an Elkdog) while the kids enjoyed their “picnic”. 8. 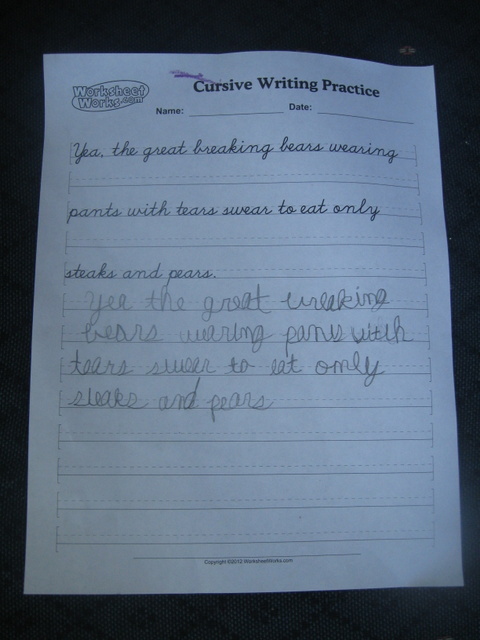 Besides our history reading, I worked with Miss M on spelling (LOE lesson #6), and Math (RightStart Level C, lessons 107-109). These were our first new math lessons since May! Most of spelling and math were smooth sailing, and I think the bumps in the road we did have this week with school and otherwise (which on at least one day were not necessarily minor bumps) are helping reveal ways that I can be more effective in working with Miss M.
9. Today we spent almost all day with friends at a huge park about half an hour from our house — it has so many slides and ladders that its nickname is “Chutes and Ladders” (It’s really the Hyland Play Area). I can’t imagine having done this while it was so hot earlier in the summer, but today’s weather in the 70s was perfect. 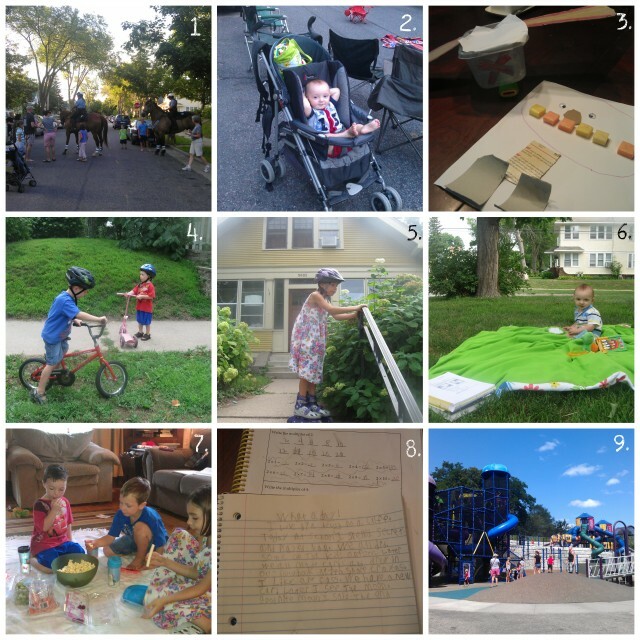 Linking up with Collage Friday and The Weekly Wrap-Up. 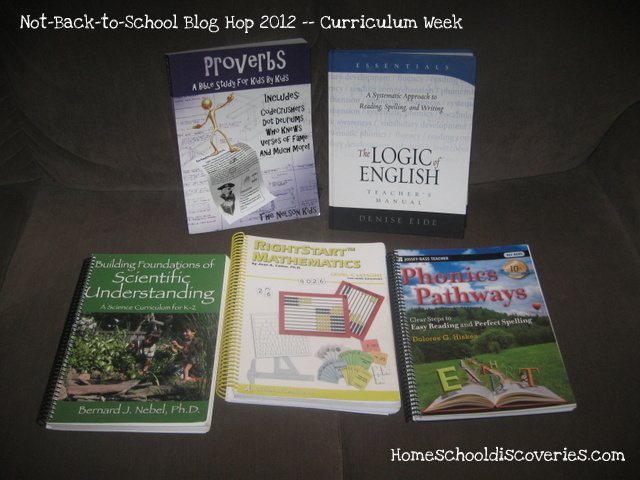 It’s time for the annual “Not-Back-to-School Blog Hop” hosted by the iHomeschoolnetwork. This week it’s curriculum week! I keep a page updated with our curriculum choices, so if you are finding this post later in the year you can check there to see if we continued with these choices! Science: Building Foundations of Scientific Understanding (BFSU) — Finishing Volume 1, Starting Volume 2 (Read here to find out a bit more about BFSU and about a resource you might find helpful Collaborative Pinterest Boards!). We’ll also be reading some science biographies. Don’t forget to visit the Not-Back-to-School Blog Hop page to find out what other homeschoolers are using this year for their curriculum! 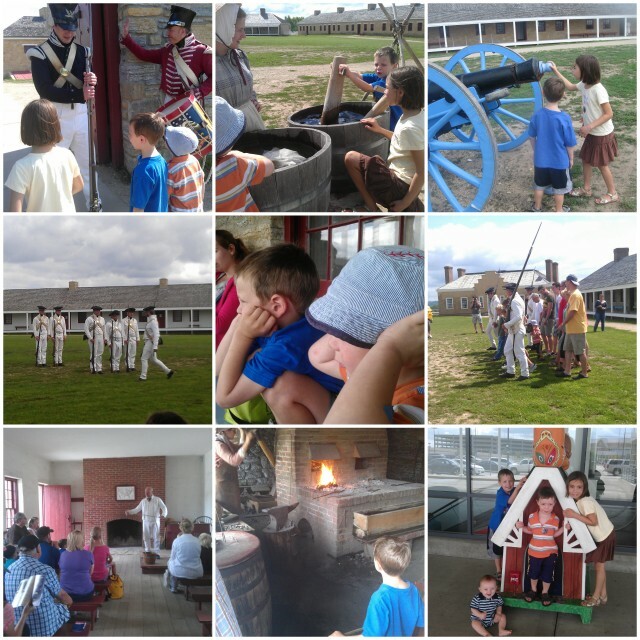 We enjoyed talking to the “soldiers”, learning about washing, school days, the blacksmith’s shop and more. Miss M’s favorite area of the fort was learning about children’s games of the 1820s. The boys’ favorite was the infantry drill and seeing the “soldiers” shoot their guns (it was loud, as you can see in the middle picture!). The boys also joined the soldiers for a march around the quad. After our visit to Fort Snelling in the morning, we stopped by Ikea for lunch (as you can see in the bottom right corner picture of the kids with the Ikea Snoopy house). We rounded out our busy day with a stop on the way home at a discount store we rarely visit (that would be the one whose initials are W.M.) for a couldn’t-pass-it-up deal of glue sticks for ten cents each. I bought 50 — hopefully I don’t wish I had bought 100 before the next year is up! We use a lot of glue around here! We let the kids stay up super late on Friday night to see the whole opening ceremonies. I made up special “Olympic Packets” for the kids with bingo games, coloring sheets and other activities to use while watching the opening ceremonies and other sports over the two weeks of the games! We’ve probably watched 1-2+ hours of Olympics each day — very different from our normal TV habits! But since it only comes around once every two years to have some kind of Olympics to watch, it seems worth it. 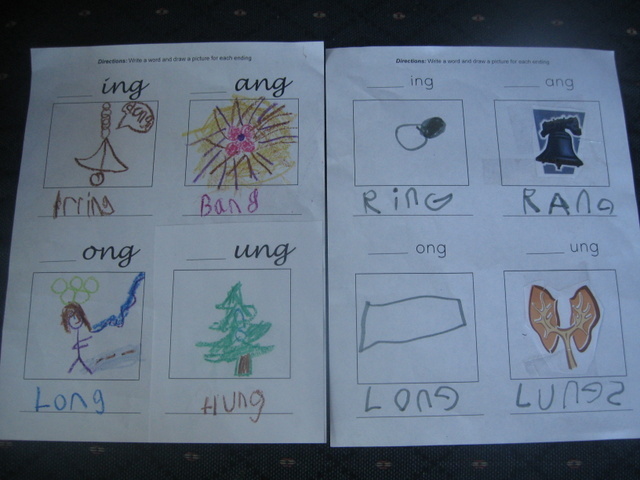 Miss M’s favorites so far are rowing and gymnastics. The boys like fencing, shooting, whitewater canoeing and archery. For some odd reason, everyone also really liked water polo. 🙂 We are all looking forward to track and field, and Miss M can’t wait for equestrian jumping. We did do a little bit of school this week (but no pictures made it to the collage! 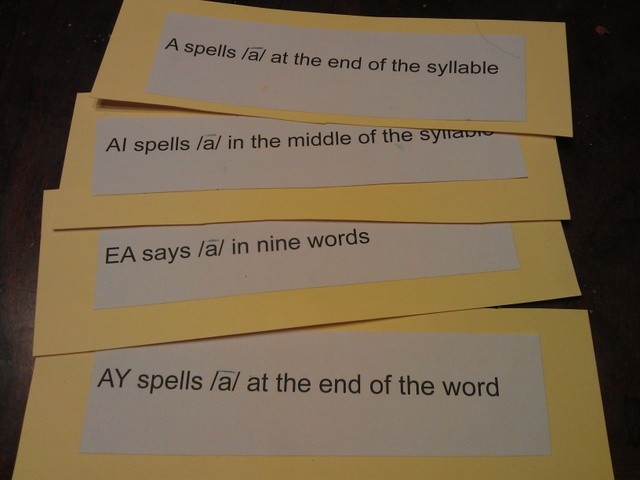 )…I tried to keep spelling fun and we started a new history read aloud. I’ll have posts coming (I hope) next week about what we’ve read so far in our first three-ish weeks of US History and the ideas I thought of to keep review and practice fun with Logic of English. It wouldn’t be the Hill family getting interesting in something without spontaneous crafts and activities. 😉 Miss M made some nice Olympic rings to hang up. Mr. E gets the creativity gold medal this week for his picture of a sport he created (“A guy stands on a really high bar with a really heavy weight in one hand and bombs in the other hand. That’s a really hard sport, mom!”). 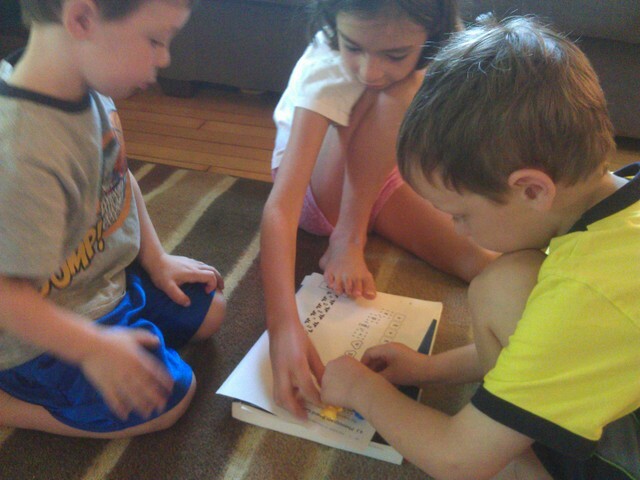 He also started the kids on a “Duplo Olympics” by setting up Duplo Synchronized Diving. Miss M followed this up with Duplo Gymnastics (each aparatus was represented!). The kids also did regular diving, archery, shooting and airplane tricks (Mr. E’s other suggested addition to the Olympic line-up). Mr. K finally had some success in the potty department this week (after four not-so-successful months, we took the last two months or so off). Miss M dressed in a rather unusual costume to present Mr. K with a gold medal for his efforts (and Mr. E followed up by presenting him with a bronze medal as well). Miss M gets the family gold medal for swimming and diving! After much hard work she passed her swim test at the pool (25 yards of the front crawl) to be able to use the diving area for the first time! Yea! Finally, Baby J gets the gold medal for “Most improved at Locomotion”. 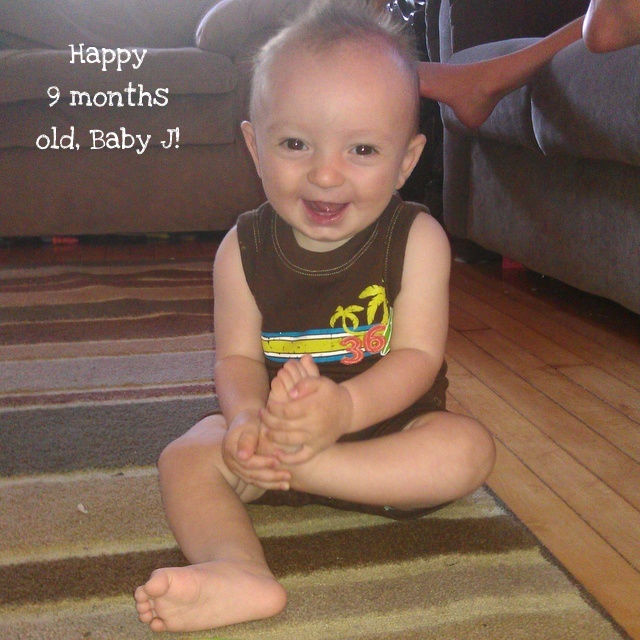 🙂 We wished Baby J a happy Nine Months Old on Monday. While he isn’t crawling yet, he certainly qualifies as “mobile.” This week he became proficient enough at scooting on his bottom to move from room to room, pull books off the book shelves, attempt to chew on cords, and discover the joy of pulling plastic bowls out of the drawer. Let the selective baby-proofing and teaching-of-“no touch” begin! I really like working on a series of books for read-alouds with Miss M in the summer — especially when I already own the books. It’s nice to just know what comes next and not have to think too hard or work too hard to find the next book. 🙂 Summer read-aloud time can be more sporadic for us since I read to Miss M right before bed, and there are more times of staying up too late to realistically do too much before-bed reading — so it’s nice not to be relying on timing our reading with books arriving from or needing to return to the library. For this summer we decided on the “Little House on Rock Ridge” series by Roger Lea MacBride — aka The Rose Years series. This eight book series features Rose, the daughter of beloved “Little House” characters Laura and Almanzo. The first book in the series, Little House on Rocky Ridge, opens as the Wilders are leaving drought-ridden South Dakota in search of a better life in Missouri. After their long horse and wagon journey, they need to find the perfect farm and get settled in before cold weather hits. Once settled in their new farm, called Rocky Ridge, of course, Little Farm in the Ozarks and In the Land of the Big Red Apple continue the story of the family settling in and trying to develop a prosperous farm. Rose goes to school, makes friends, learns life lessons (all the stuff you might expect in a “Little House” sort of a book). Fans of the original “Little House” series will probably enjoy these books as well, though they don’t quite have the same classic quality to me as Laura Ingalls Wilder’s books. It’s hard for me to put my finger on exactly what it is that makes me feel that way about these books. I did find it somewhat tiresome that some incidents from the original series are “re-told” in the Rocky Ridge series books in the form of family stories being told to Rose. While I’m sure this is helpful background to a small number of readers who didn’t read the other series first, I could have done without those passages. Unlike many of the books in the original Little House series, the early books in the Rock Ridge series take place one right after another with very little elapsed time in between each book — or no elapsed time in the case of books #3 and #4! We started book #4, On the Other Side of the Hill, just before the Olympics started (completely distracting us from getting any bedtime reading aloud accomplished!) and it starts literally hours after book #3 ends! Reading the books one right after another also makes it feel odd that the background of some characters or key incidents are re-told in the text of each book. I suppose this is necessary for readers who may take longer breaks between each book or jump into the series mid-way, but it felt awkward to me. I can’t remember any moments like that in the original series (but we did take longer breaks between some of those books, so maybe I’m just forgetting about it!). While I don’t usually go out of my way to plan any activities to go along with our bedtime read-alouds, I couldn’t resist buying a can of hominy after reading about the Wilder family making hominy in Little Farm in the Ozarks. Everyone in the family liked this not-common-around-here dish. We also spied a copy of McGuffey’s Third Reader in a gift shop last week — Rose’s class in school reads out of this book in Little Farm in the Ozarks and Land of the Big Red Apple. It was fun to show Miss M what Rose’s book would have looked like! Miss M is thoroughly enjoying these books — to the point where I am wondering if she will complain when we get closer to the end of August and I will want to move on to our new “school year” list of read-alouds. Maybe I’ll just let her take the rest of the books we don’t read before the end of the summer and she can read them on her own (except that I do kind of want to find out what happens to Rose too! ).